Pumpkin Steel Cut Oatmeal | Naturally. This fall has had great weather and beautiful color, I just wish I wasn’t so busy that I could have enjoyed it more! However, gone are the long football games, one of my classes, and a lot of the hectic scheduling of marching band. It is smooth sailing to Thanksgiving break! Hopefully now I can catch back up with my blog- I have some great product reviews coming up and tons of recipe ideas I can’t wait to try! With the temperatures dipping into the thirties, I have hit that point where getting out of bed is that much harder (I finally caved and turned on my heat.) This is also the time I start craving hot and hearty foods for breakfast. A bowl of cereal just isn’t going to cut it. This recipe is perfect if you have a little left over homemade pumpkin puree or if you have an extra can of pumpkin floating around the house. 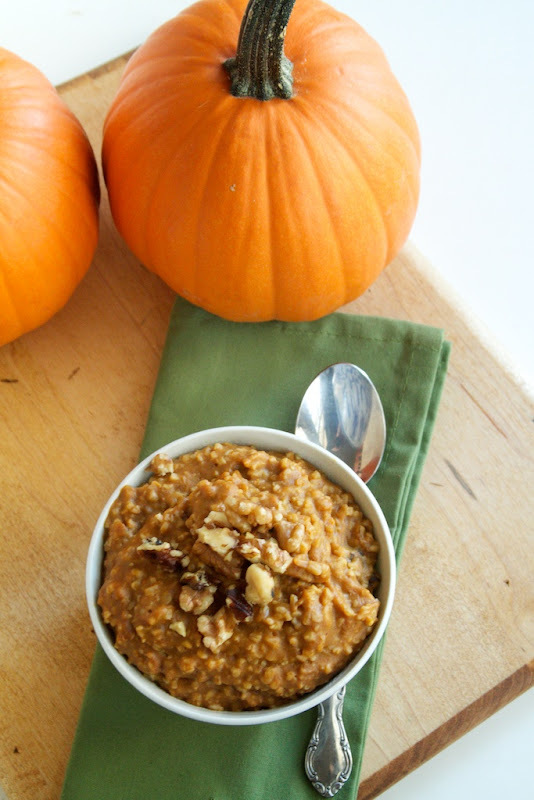 Oatmeal is already hearty and adding the fall flavors makes it that much better! Once oats are almost done, add remaining ingredients into the oats and continue to cook until the oats are cooked..
Once oatmeal is done, place in a bowl and top with a few extra walnuts. I used to dislike oatmeal but not anymore. I love making overnight oats and the occasional warm outs and am enjoying experimenting with different toppings and ingredients. 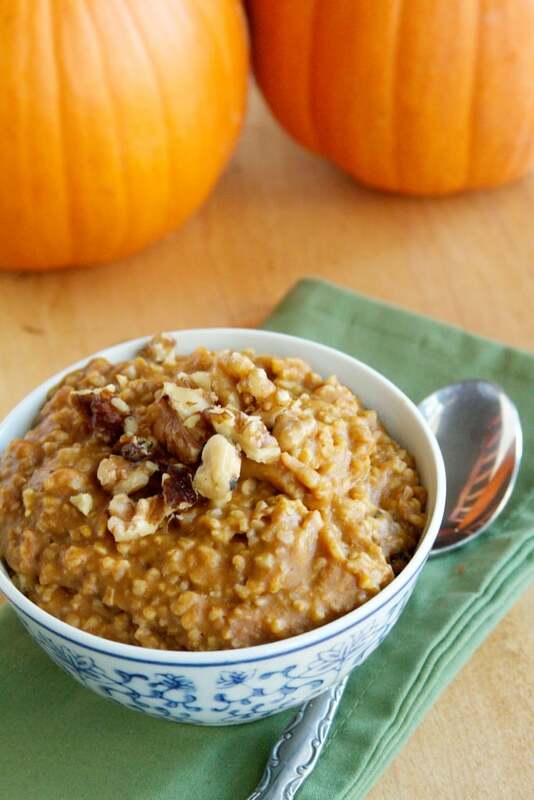 We love steel cut oats and eat them almost everyday. I think this would be delicious but I do not know what ‘sucanat’ is. Pleas explain? Here is a link to my sweeteners ingredient page and will explain what sucanat is! This looks so good, I have been seeing it everywhere lately and I really need to try this one. Sounds yummy, I will definitely try this. That was a good informative page of sweeteners. I thought I’d mention palm sugar to you. Its better then agave syrup and lower on the glycemic index. I really enjoy it you might also if you haven’t already tried it. I have been meaning to try palm sugar and probably should now! YUM! I can’t wait to try this! Sooo perfect for fall and my current pumpkin obsession! Funny, I was just thinking we hadn’t had steel cut oats in far too long. I’m hoping to try this pumpkin version on Saturday! Is “2 teaspoon cinnamon” the right amount? I’m making this oatmeal right now and I just added in the cinnamon and the oatmeal was DARK brown and tasted unpleasantly strong (and I’m a huge cinnamon fan). Your oatmeal still looks pleasantly orange, so I was wondering if the “2 teaspoon cinnamon” was a typo and if, perhaps, it was only supposed to be 1/2 teaspoon? Yum!!! 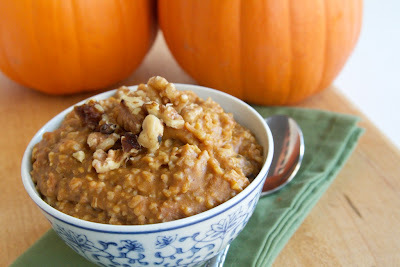 I can’t wait to get back to the states and get my hands on some pumpkin and steel-cut oats so I can make this!! These oats look super voluminous…and delicious!